Piaggio India has showcased the Aprilia RS 150 and the Aprilia Tuono 150 at the 2018 Auto Expo in Greater Noida. 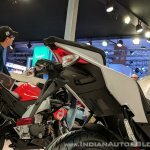 Here are the two motorcycles’ live images from the show. 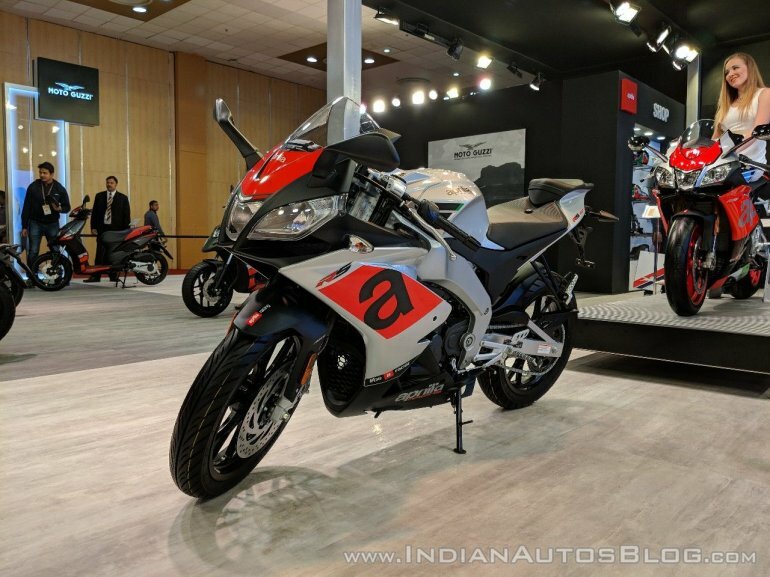 The design language of the Aprilia RS 150 is identical to its litre-class brother, the Aprilia RSV4. 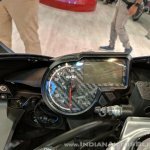 The motorcycle comes with triple headlamps at the front, with a full fairing on the sides. 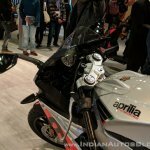 The motorcycle sports the Aprilia livery on the bodywork. 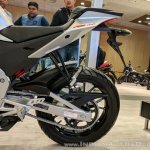 The Aprilia Tuono 150 is a semi-naked iteration of the RS 150. 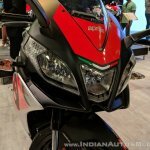 The motorcycle gets a quarter fairing along with the Aprilia livery as well. 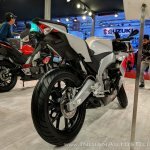 The Tuono 150 gets a relatively relaxed ergonomics thanks to the single piece seat and street handlebars. The RS 150 on the other hand comes with clip-ons and a split seat for a sporty riding position. 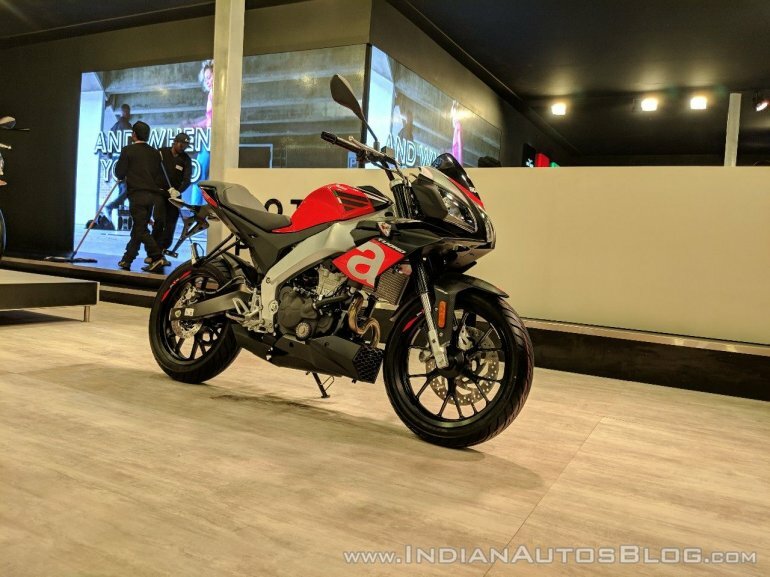 Coming to the powertrain, the Aprilia RS 150 and the Aprilia Tuono 150 share a new 150 cc single cylinder engine with liquid cooling and fuel injection. The mill makes 17 bhp at 10,000 rpm, and 14 Nm at 7,500 rpm. It sits inside an aluminium perimeter frame, and mates with a 6-speed transmission. A Quickshifter as an optional fitment. 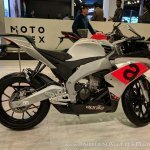 The motorcycles ride on 40 mm inverted fork at the front and a monoshock at the rear. 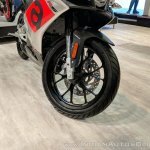 Brakes include 300 mm disc at the front and a 218 mm disc at the rear. The brakes feature a single channel ABS. 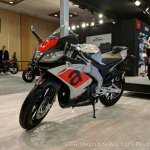 Aprilia is gauging customer response with the showcase of the two bikes. 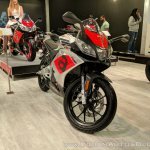 The brand already sells the 125 cc versions in the international market, but the 150 is an all-new product. 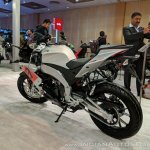 The launch will happen next year, with an expected price of around INR 1.5 lakhs. 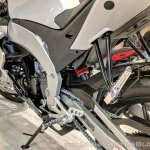 When launched, the RS 150 will rival the newly introduced Yamaha YZF-R 15 V 3.0; and the primary competitor of the Tuono 150 would be the Suzuki Gixxer.